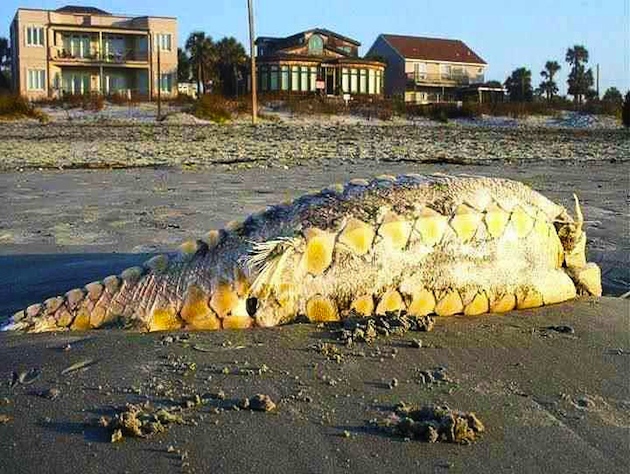 Something strange washed ashore on Folly Beach in South Carolina this past weekend. The beast had some wondering if it was some sort of new species. Be not afraid, land dwellers. According to AOL's Pawnation, the freakishly large creature may look alien, but it is harmless. A veterinarian from a South Carolina aquarium identified the fish as a sturgeon. The Atlantic sturgeon can grow to 15 feet in length and weigh over 800 pounds. It won't win any beauty contests, but the Atlantic sturgeon has a lot more to fear from humans than we do from it. The Atlantic sturgeon was recently placed on the endangered species list. According to a February article from the Washington Post, the Atlantic sturgeon is a popular target for caviar. Limits have now been placed on the number that can be caught.